Everything you need to know to buy or adopt an Appenzeller Mountain Dog puppy or adult dog. Is an Appenzeller Mountain Dog the right breed for you? Are YOU right for an Appenzeller Mountain Dog? Should you get a male or female Appenzeller Mountain Dog? 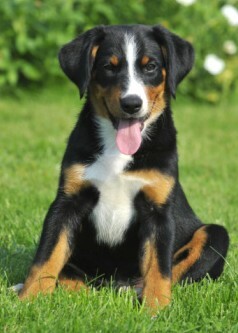 What age should your new Appenzeller Mountain Dog be? Where can you buy or adopt an Appenzeller Mountain Dog? Appenzellers are very uncommon and difficult to find in the United States. I'm not aware of any Appenzellers available from a Dog Rescue group. You would need to inquire of the breed's national club. Same as above.... I'm not aware of any Appenzellers appearing in an animal shelter or humane society. Certainly there are dogs who might look something like Appenzellers, but those physical traits can appear in crosses and mixes that have no Appenzeller genes whatsoever. Very hard to find. Your only source is likely to be a show breeder, who breeds Appenzeller Mountain Dogs to match a detailed standard of appearance for the dog show ring. If a seller can't show you those certificates, the puppies are higher risk for health problems. You might choose to accept that risk. But then you need to be willing (and able) to pay a couple thousand bucks for future surgeries and lifelong meds if your Appenzeller Mountain Dog ends up with hip dysplasia. I have never seen an Appenzeller in a pet shop. Which is good, because I have plenty to say about buying a puppy from a pet shop! How to test the temperament and personality of Appenzeller Mountain Dog puppies and pick the best puppy in a litter.